E.A.T. : Sunday Supper "Cheese- and Shrimp-Stuffed Roasted Poblanos with Red Bell Pepper Sauce"
Sunday Supper "Cheese- and Shrimp-Stuffed Roasted Poblanos with Red Bell Pepper Sauce"
Couple of days ago in the world of social networking (Blogger, Twitter, or Facebook I honestly cannot remember which) I talked about the 4 big fresh poblanos picked up from the market. 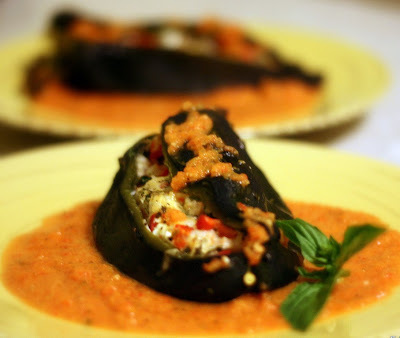 Well this "Cheese and Shrimp Stuffed Roasted Poblano with a Red Pepper Sauce" recipe did not disappoint. Several steps of course but overall a beautiful tasting dish both for the eyes and the palate. It's Sunday, head to the market and make your own Sunday Supper!